When it comes to the future of computing, there is one major known and a principal unknown. The known, with almost guaranteed certainty, is that the next era of computing will be wearables. The unknown, with commensurate guaranteed uncertainty, is what these wearables will be and where on your body they will live. Apple and Samsung, for example, are betting on the wrist; Google, the face. A slew of tech companies believe clothing will simply become electronic. Yet there’s a whole new segment of start-ups that believe all of the above are destined for failure and that we humans will become the actual computers, or at least the place where the technology will reside. 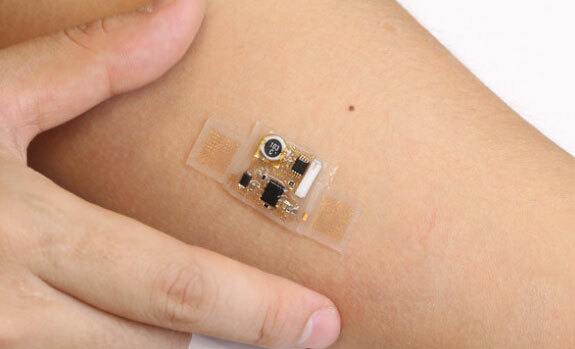 Their enthusiasm is on an emerging class of wearable computers that adhere to the skin like temporary tattoos, or attach to the body like an old-fashioned Band-Aid.